Our patio expands our living space, as it sits right off our family room. It is lived in and because of our weather used almost 365 days a year. By adding comfortable furniture, your outdoor room becomes more inviting. All our furniture out on our patio was either given to us or bought on sale so it does not have to cost much to make an outdoor room comfortable. Flower containers are your artwork and bring happiness when you are outside viewing and tending them or something pretty to view through your windows and doors. I often stand at the French doors and look at the pots of flowers. It just calms me and makes me well, happy. A water feature or fountain not only is lovely to the eyes but acts as a sound barrier to city noises. The constant trickle of water I swear lowers your blood pressure. We celebrate birthday, holidays and nice sunny days out here. Our outdoor patio is indeed another room of our home. 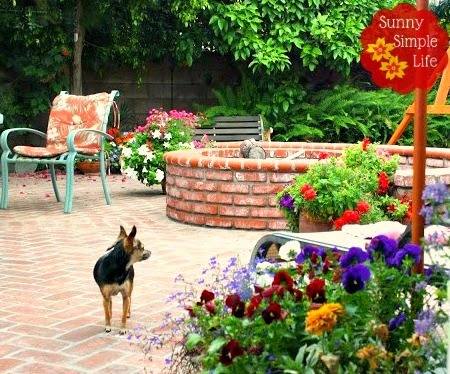 Your patio and the flowers and comfy chairs are very inviting and are indeed, an outdoor room. We feel the same about our patio; I will post a photo some day soon. I absolutely love your patio. Looking at the pic. 's you post of it always brings a smile to my face. Still way too cold her to have any flowers yet. Your patio is gorgeous and so full of color. We sure spend a lot of time outside enjoying ours too. You do live in a perfect climate for that. It is lovely! Surprisingly, even up in the Northwoods we try to get as much 'summertime' in as possible, putting container gardens on patios, porches, etc. If it ever gets up to 50 degrees, I'll be having breakfast on the front porch! It looks so warm and inviting. If my patio looked like that I would be out there all the time. Going to be in the 20's today and a little snow tonight.....so no patio time today. Soon.....I hope. Une publication qui sent bon le soleil avec ces photos de fleurs très généreuses. It looks very lovely and inviting I can't wait till we are able to use ours. I've been thinking about you. Has the earth been shaking @ your house? I've been worried.